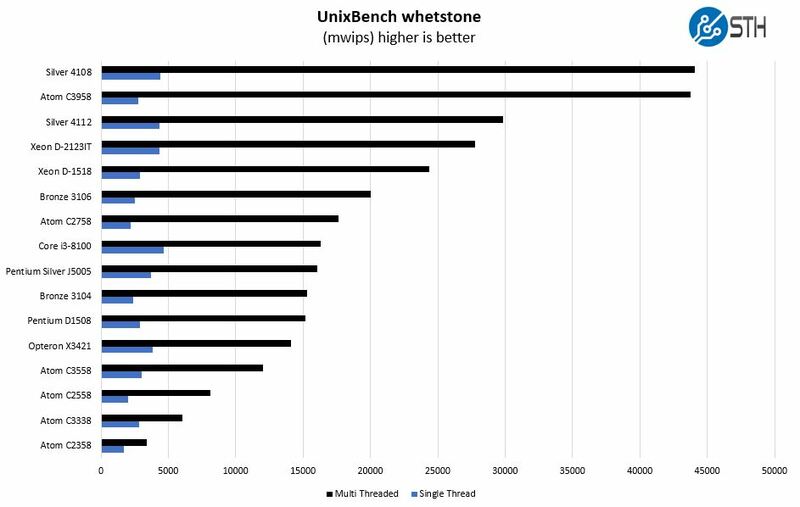 Here we can see solid performance just above what we saw with the original Goldmont architecture represented by the Intel Atom C3558. 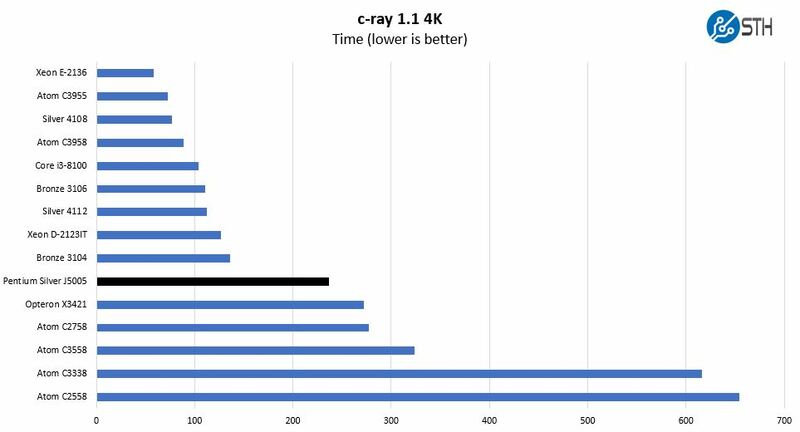 The Intel Atom C3558 suffers from a maximum clock speed of 2.2GHz in comparison to the maximum clock on the Intel Pentium Silver J5005 of 2.8GHz. Here you can see that the four core Intel Pentium Silver J5005 performs well against the eight core Intel Atom C2758. 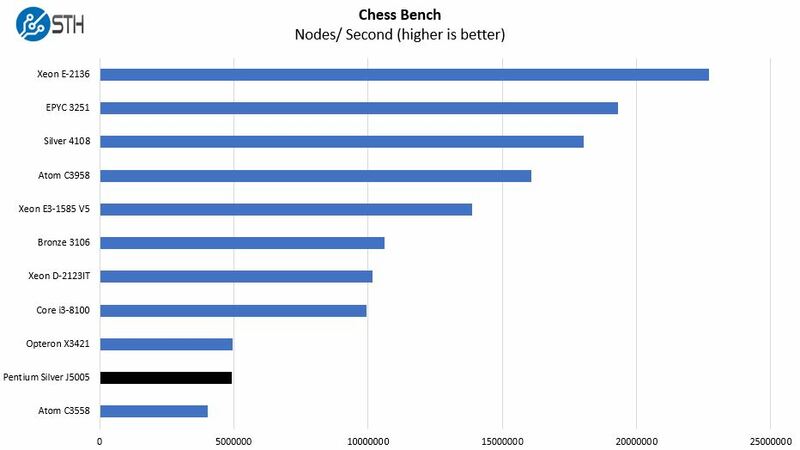 That shows just how much advancement the Intel Atom team is making. The Atom C2758 had a more robust feature set with items like QAT and multiple MACs. At the same time, the Atom C2758 had twice the TDP at 20W. Here we have some absolutely great performance. We wanted to point out that the performance is about on par with the AMD Opteron X3421 in this case and many others. The AMD Opteron X3421 has features such as more PCIe 3.0 lanes, but these products are somewhat competitive. We normally augment this with our GROMACS workload, however, we are going to skip that in this review. 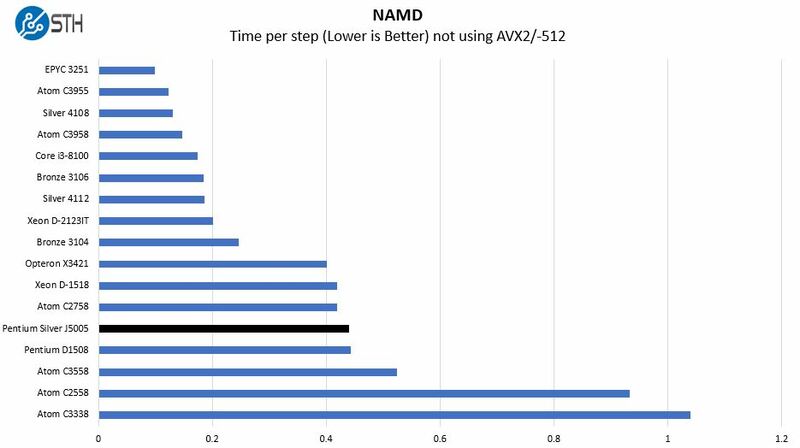 With GROMACS we support AVX-512 and AVX2 but these chips are not targeted at this kind of workload. The Pentium Silver J5005 here falls just between the Pentium D1508 (2C/4T) and Atom C2758 (8C) parts. 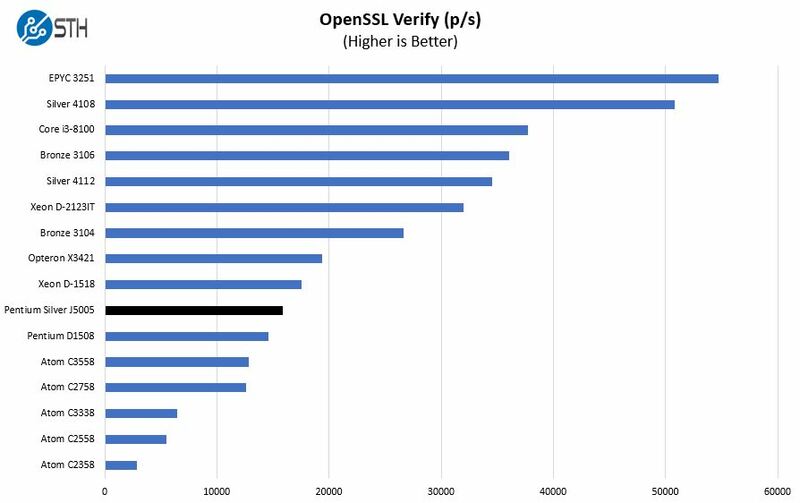 This is another great result which is helped by the benchmark size and the higher clock speed of the Intel Pentium J5005. 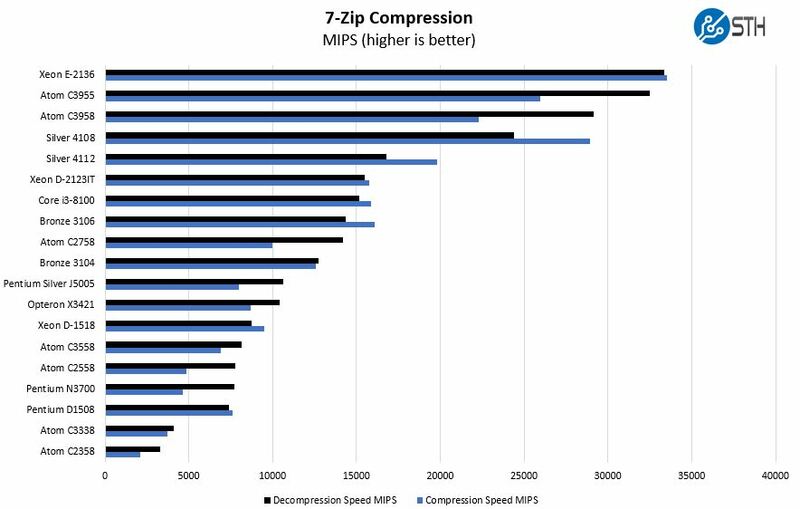 As you can see, the overall performance is very good for a 10W TDP part. 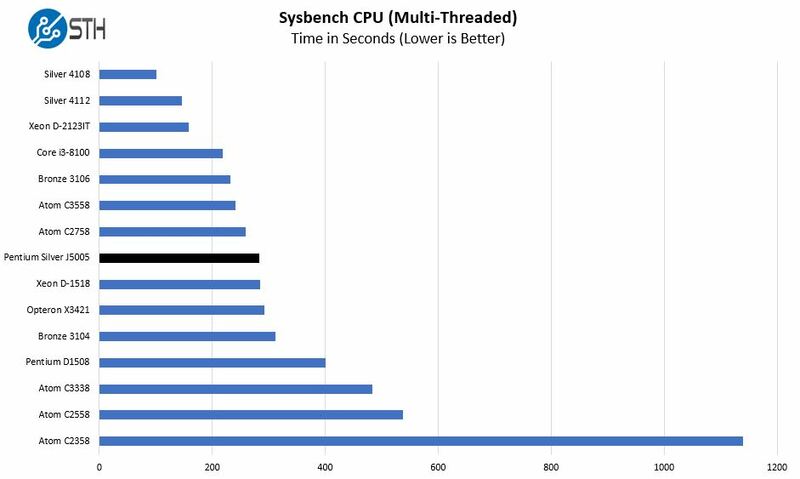 Cutting a lot of the I/O from the platform yields TDP dividends which in turn helps CPU performance. Overall, these are good results. 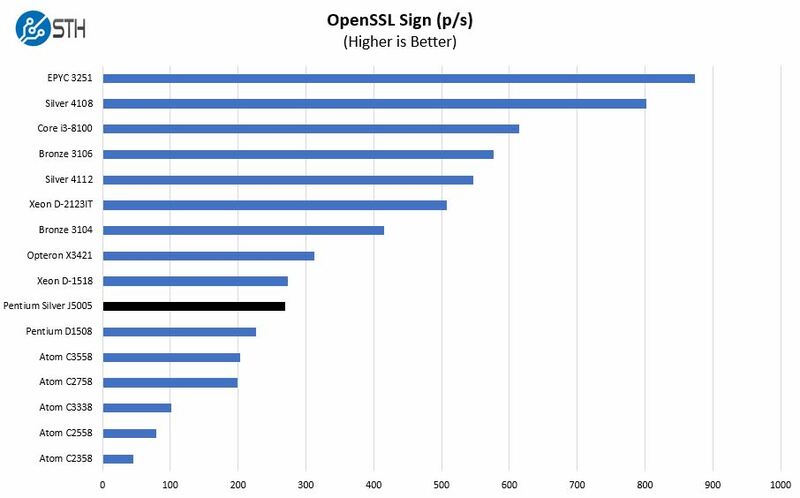 We see performance just above the AMD Opteron X3421 which is a welcome result. Here we wanted to point out that as good as the Intel Pentium Silver J5005 is, the $161 price tag is steep. In comparison, the Intel Core i3-8100 is less expensive and offers significantly more performance. There is a premium for going fanless with a low TDP. 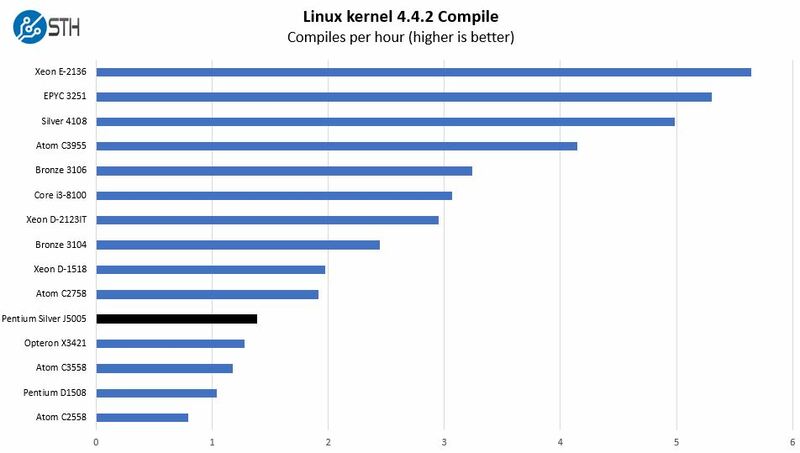 Patrick, why do you always write “Python Linux 4.4.2 Kernel Compile Benchmark”? What does python have to do with compiling the Linux kernel? Hi Marcelo B. 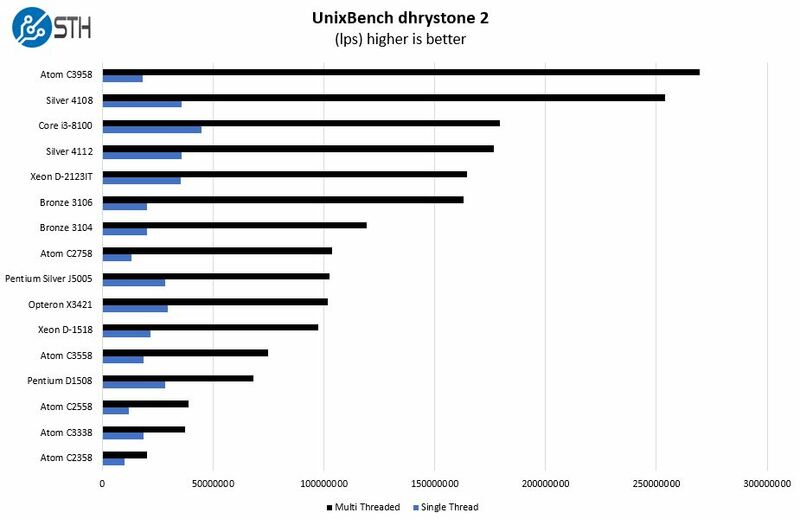 This is the second version of our Linux Kernel Compile benchmark that was one of the first ones we launched via a Python setup script. It is just a label to differentiate this versus our older one. The $161 is basically a placeholder for CPUs like these. 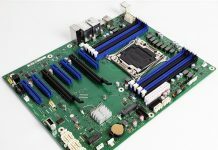 The Asrock J5005 motherboard with the J5005 chip integrated costs $119 in Newegg, which is same as what the i3 8100 goes for at the same site. Consumer level tests show 30-40% gain over the Goldmont predecessor due to significant uarch changes. I’m surprised the gain is less compared to the C3558. Any idea where to get about 3 dozens of these? cant seem to find it online, the websites that list this restrict buyers to their customers and i can’t even register. Our review of the platform is in the final editing stages and hopefully today/ tomorrow it will go live. Your best bet is to call a Fujitsu reseller.